Why does Harry Hare, television spokes-hare for the National Hare Council on Carrots, race his longtime friend, Tommy Tortoise? And why can’t Harry’s niece, Harriet Hare spell carrot? 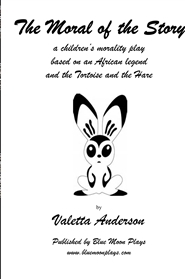 This modernized children’s play contains an ancient Ibo (northern Nigeria) legend. The Tortoise and the Hare is the most famous of Aesop’s fables about a Hare who mocks a slow-moving Tortoise. Irked by the Hare’s scornful behavior, the Tortoise challenges him to a race. The moral of this story has always been ambiguous and Valletta Anderson’s script throws intriguing new light on the subject for questioning young minds.